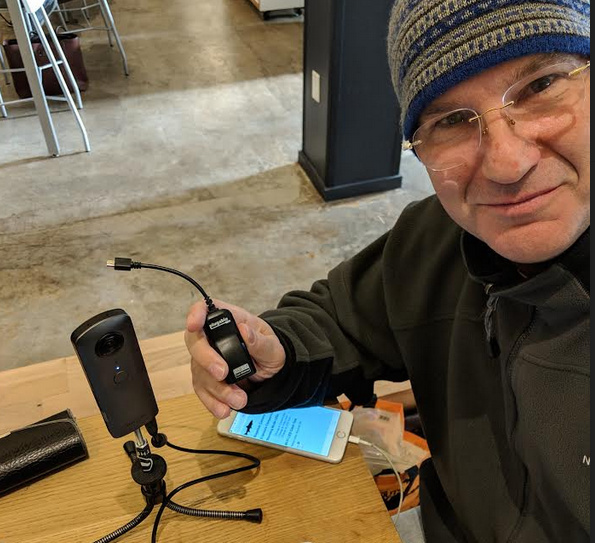 Coincidentally, I just met with @jcasman at HanaHaus in Palo Alto and he was about to test Ethernet with the THETA V.
I’m using the theta V connected to the Plugable OTG. Just got the Plugable OTC cable, I’m going to be doing some similar testing. Thanks for asking your questions - and thanks to @codetricity for the links and suggestions - I think I’ll be running into similar issues. It’d be great if you could test it on Windows 10 as it’s easy to find the IP address on Mac since Bonjour is built-in. I have a Windows 10 laptop, I can test it. It’s not my main machine, but I’m happy to try it out. Hey, not adding a ton of info just yet, but giving an update that this weekend I connected to Ethernet easily, directly from my router. It “just works.” I’ll be trying to it set up connected to a Windows 10 laptop using DNS discovery. try different types of powered USB hubs and other USB OTG connectors to see if there is any way to power the camera while it is connected to Ethernet. I have not succeeded in my tests. I’m attempting this and purchased the 1st OTG example you tested with. So far, no power from that. I’ve used direct USB streaming to OBS studio successfully, so I understand to toggle to “live” setting for that task, but right now the dongle seems to show no sign of life though plugged into my home router and the Theta V. I’ve also loaded the suggested driver to the Theta, but it will not switch to “live” at the moment. Should the adapter be working (& drawing power from the Theta) any time that the theta is turned on or do I have to switch to a particular mode? It needs to be plugged into both Ethernet router and the THETA for the lights to go on. No other button or setting needed. THETA needs to be turned on. Any mode of the THETA should work. Does not need to be in plug-in mode. Amber light will flash to indicate network traffic. Please plug the THETA into your home/office router with Ethernet and also plug the dongle into the THETA V and report back. Hmm. Ok, well I’m starting to suspect my OTG adapter isn’t working right- I will try some other things and report back. Perhaps I will pick up a replacement adapter as well. I have it hooked up just as you’ve done. I hope you have 100% refund on that if you just bought it. Maybe try with a different cable? Yep- just an amazon order away! I’ll get it eventually, I’m super excited this functionality exists as it’s critical for my application. After I sort this out, I’ll probably try a battery hack & memory upgrade too. 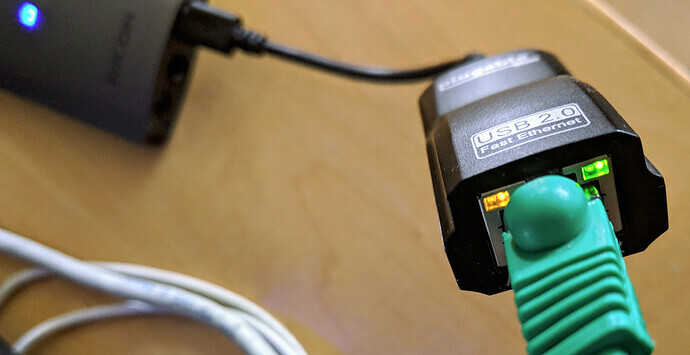 Does the adapter work if you plug it into a normal Android mobile phone or tablet? Maybe you or your friend has one? 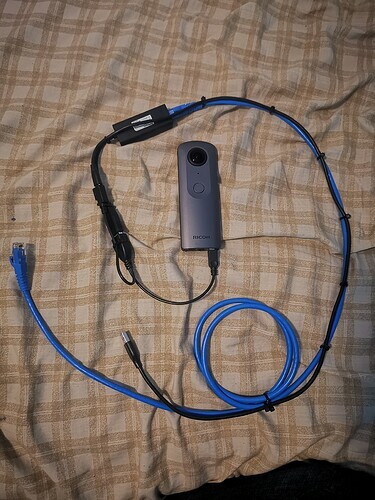 the camera itself wasn’t actually directly accessible previously, but turns out I had flipped my data + & data - to the USB port (it’s soldered in a custom setup- though somehow this didn’t affect my ability to read the Theta as a storage device via usb). Anyway, I’ve since corrected that error and now the adapter seems to at least light up. Regarding your settings though- using OBS I can stream thru the usb provided I switch the camera to “LIVE” mode (& only then). You’re saying that streaming to the ethernet adapter should work regardless of which mode the camera is set to, right? Are you using this plug-in? The normal “LIVE” mode of the THETA will not stream through IP, only USB. The guide below is old, but may still be useful. You don’t need OBS. The camera can directly stream to YouTube or Facebook using RTMP. Hi, other people may have more information on this topic. I’ve only used the Ethernet with a few of the plug-ins in the THETA store. I’ve used it with Wireless Live Streaming to YouTube and Facebook. I’ve also used it with File Cloud Upload. Though, I think that plug-in recently stopped working. 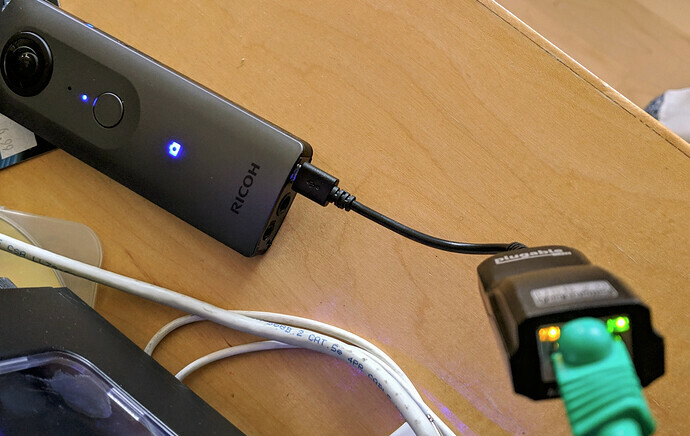 If you want to connect your THETA to a Mac/PC with a wire, the best way is with USB. I also looked at a USB to CAT5 solution. Thanks for sharing this. Can you power the THETA indefinitely using this solution? How long have you tested it for? Many other people are looking for this solution. This is a great add to the community. The device does receive charge and does connect to the network, I will have to test if i can communicate and get its current battery status.